My roommate Alex just finished an ultramarathon–the JFK 50 Miler–yesterday, coming in 41st out of 1050 competitors. (Congrats, Alex!) Needless to say, he’s pretty intense when it comes to running. He subscribes to running magazines, plots out his training schedule months in advance, and reads books upon books on marathoning. 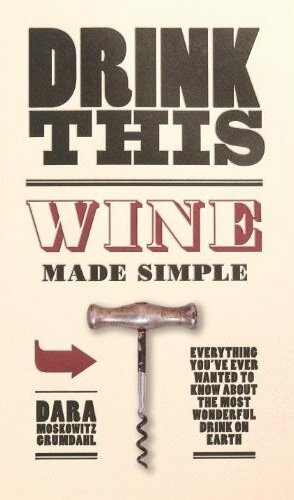 A few weeks ago I received via the post an advance copy of Dara Moskowitz Grumdahl’s new book, Drink This: Wine Made Simple (Ballantine Books, 2009). I was sort of skeptical about the bold claim printed on the cover, “Everything you’ve ever wanted to know about the most wonderful drink on Earth.” I’m also generally skeptical of wine experts who claim that they are wine experts (as Ms. Grumdahl does when she points out that she has “so many wine writing awards that the heavy bronze medals are the first thing” she reaches for to use as weapons when she thinks she hears burglars at night). However, her book is not condescending at all, and though I was afraid the book would simply be a soapbox for her and her achievements it actually is full of witty, self-deprecating humor and very useful information. The wine is divided into twelve sections, with nine on specific wine varietals and three on general topics like the economics of wine and how to order wine in restaurants. The varietals are zinfandel, sauvignon blanc, riesling, chardonnay, cabernet sauvignon, syrah, sangiovese, tempranillo, and pinot noir. I would have liked to see malbec in there because it’s become such a ubiquitous grape, but Grumdahl covers the nine she did select very well. The book is also practical. For each varietal she talks about the “holy trinity”–namely, the grape, its terroir, and the winemaking–that gave rise to its constituent wines, and she provides tips on putting together wine tastings. She gives recommendations at every price point, and provides a five-second cheat sheet summarizing what she wrote about each varietal. As a bonus, she also puts in excerpts from wine industry “bigwigs” that all wine nerds will be able to appreciate. Grumdahl also advocates a “two at a time” tasting method, which she states is the fastest way to learn about wine. It consists of tasting two wines of the same varietal which are made in a similar style. She builds upon this baseline and puts together tasting flights for each varietal that are designed to provide the optimal contrast between regions and price points. There are tasting tips, as well as a table of possible scents/tastes for each grape. All in all, Drink This is an entertaining, informative, and ultimately very useful book. It is especially useful for beginners who want to learn more about the why and how of wine, or for those who want to start hosting wine tastings. It is also a nice reference for those with a bit more wine knowledge. The only critique I have of the book is in terms of layout. It is standard-novel sized, so many of the sidebars included in the book are broken up by page breaks. This makes the book nominally harder to follow. Mark Oldman’s book, which is oversized, avoids this problem and therefore flows better. Nonetheless, I would recommend this book–it would make a good present for the nouveau oenophile in your family or social circle. Drink This: Wine Made Simple by Dara Moskowitz Grumdahl comes out November 24! Wow, I am totally excited about this book. I live in the Twin Cities and am lucky enough to get Dara’s writing on a regular basis, and I have been a big follower of hers for a long time. I am glad to hear that her book is such a great read as well. I will be stuffing some stockings with it for sure. Thanks for the review! No problem at all! It’s a great read.